Uma Shankar Shukla graduated (B.Com) from Delhi University. He started teaching Astrology in the School of Astrology. Uma won a gold medal in 1997 in Astrology, having accurately predicted many events. He is skilled in providing health tips from Yoga and Meditation. He is now working as a freelancer with many newspapers and magazines in India, providing articles on Astrology, feng-shui, Numerology, Ancient Science, and Meditation etc. Uma enjoys writing, reading and listening to music. He has been married since 1998. Uma is a great contributor also to our sister site, TruthStar, as well as publishing his own Vedic astrology site, Astrolozy.com. All stones and gems have magnetic powers. Our leading Jyotish astrologer, Uma Shankar Shukla, advises that most of them also have the power to heal. The vibrations and frequencies they emit influence human beings in a very powerful way. They create strong energy fields that are absorbed by the body. The creative world of the universe has three qualities – light, rhythmic motion and colour. Every luminous body emits radiation, which travels through space in the form of waves and pulses at a certain frequency. Light emanates seven major rays that have varying wavelengths. Gems are the manifestation of cosmic light. 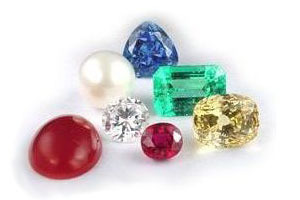 Each gem has a special colour that works as a prism to concentrate and focus light into one's body. It is a scientifically known fact that our body is composed of cosmic radiation and seven colours. These colours are violet, indigo, blue, green, yellow, orange and red The balance of these colours in our body is disturbed over time. Colours heal because of certain molecular reactions that occur in the organs due to light. Gems if chosen scientifically provide radiation, which are beneficial for the body. The first is found over the base of the spine. The second, over the spleen and sexual organs. The third is located over the solar plexus. The fourth is located over the heart. The fifth chakra is found at the throat. The sixth is the third eye, between the eyebrows. The seventh is found over the crown of the head. Our body heals when white light flows harmoniously through the chakras. Problems arise when there are obstructions to this light entering a chakra. Gems emanate the rays needed by each chakra and radiate a light that goes to revitalise those cells that are not functioning properly. Similarly each gem radiates a colour that goes to heal the aura that encircles each human being. The aura exists in seven states which are the physical-etheric, the astral, the lower mental, the higher mental, the spiritual causal, the intuitive and the divine or absolute plane. The rays emanated by gems with their energy add comfort and serenity to our lives and create harmony both in the body as well as our aura, which create a healthy and conducive atmosphere The result is that we gain positive results in every aspect of life: wealth, power, health and fame. Each gem is a perennial source of a particular ray. These rays never become exhausted, even after years of use. They can cure maladies when medicines fail. Steeped in myths and legends, countless beliefs and fascinating tales are related about the mysterious powers of gems and precious stones. Wearing a blue sapphire, for instance, is widely believed to bring you a fortune, love, and even release from prison. Since ancient times, gems, precious and semi-precious stones have been associated with the zodiac signs and continue to be credited with possessing power to bring luck and change the course of an individual's life. Which, according to the zodiac, is the right stone for you this year and what can it do for you in the months ahead.....? In part two of this article, Uma Shankar explains that gems can protect us against the bad influence of malefic planets, for they release positive energy. They can also reinforce the good influence of the benefic planets, if used properly.